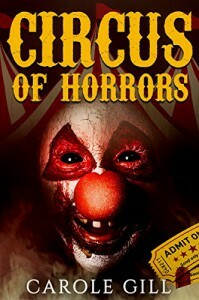 Circus of Horrors by Carole Gill is FREE August 30th and 31st at Amazon! There are demonic, flesh-eating clowns, murderous midgets, there is a fat lady with some peculiar tastes (to put it mildly) and there is an old man with one hell of a secret. Old Pa keeps a trunk with some very special souvenirs. When a stranger joins up who has second sight (among other talents) the old man's son gets nervous. If that isn't enough, there are a lot of very strange beings not to mention a succubus or two and some beings from hell! Buckle up it’s one hell of a ride, literally.